This post is linked to A Gluten Free Holiday: Desserts! When my children woke up hungry for breakfast this morning, I mindlessly plodded over to my refrigerator in my comfortable slippers and cozy pajamas. I perused my shelves stocked high with food and shuffled things around. My mind was wandering to what my to-do’s entailed for the day, not to what was about to go in my children’s mouths. I mumbled to myself about how over-full my refrigerator was. I made a mental note to organize it. I reminded myself to toss the steak from a few nights before. Yes. Throw it away. I pulled out a carton of farm-fresh eggs that we had just picked up the day before at the Farmer’s Market. I grabbed some green onions. I rescued the leftover vegetables from the night before, already pushed to the back, quickly about to be forgotten. From the counter, I grabbed some beautifully ripened pears and a couple of my Gluten Free “Bran” Muffins that I had baked the night before. But as I think back to when I placed that plate piled with nutrients in front of them, I realize that in that harried moment of trying to get everyone ready and off to school, I did not mark with gratefulness how truly blessed my children are to begin their day with such sustaining food. This morning, in that moment, we did not take the time to acknowledge those 1 in 6 American children who will worry today about where their next meal will come from. We did not recognize the more than 12 million children who did not start their day off with that nutritionally sound and ever-so-important meal of the day. We did not acknowledge the children that do not know the comforts that my children have, that your children have – the warm homes in the dead of winter, the hot meals that fuel growling stomachs, the new jackets and the coolest shoes that get replaced as fast growing arms and feet outgrow them. This morning, instead, I was wondering how I was going to get my three year old to finish his breakfast in time to get him dressed. I was busy convincing my six year old to take “Just one more bite” – that same bite that way too many children would give anything for. And now, I feel sheepish as I type this. Here I am asking you to work with myself and the more than 50 other food bloggers participating in a first ever virtual 7 course Progressive Dinner Party called “Share Our Holiday Table” to help those very children that I was too busy (with my own comfortable life) to think about this morning. But this Food Blogging event is trying to change that. It is trying to bring this issue into the forefronts of our minds. It is an effort to get us all to think about these children on a regular basis. We all have the same purpose – to leave NO KID HUNGRY!! We are all coming together to bring you amazing holiday menus to help increase awareness and to make a change in childhood hunger in the United States. You can help us by contributing to the Share Our Strength’s “No Kid Hungry Campaign”. It does not matter how big or small a contribution. Every dollar can help to feed a child. I know that I have already made our family’s contribution and taken a pledge to not let my family forget those children. Our family has done it prior to this and we will continue to do so. You can do the same. If you know where your next meal is coming from, then go ahead and click here: NO KID HUNGRY. Whatever you can contribute can help to make a difference. So today, I will share with you the Gluten-Free Dessert course of this amazing Virtual Progressive Dinner Party. My Cinnamon Pear Upside Down Cornmeal Cake is one of my favorite desserts (I know the name is a mouthful). It comes together so quickly and, before you know it, you have a dessert worthy of the most impressive of dinner parties. I will not go on and on about the pleasures of this cake. Just make it. You will truly enjoy it. I promise you. It is not overly sweet. It is just right. Perfect, really. 1. Heat oven to 400 degrees. Grease sides of a heavy 9 inch cake pan. In the bottom of the pan, place butter slices and brown sugar evenly over the bottom. Put pan in oven and watch until the butter and brown sugar start to bubble – about 5 – 7 minutes. Remove pan and arrange pear slices in a circular pattern around the bottom of the pan, turning each slice once to coat in sugar mixture. Be careful – pan is hot. 2. In large bowl, whisk together cornmeal, almond flour, sugar, baking powder, baking soda, sea salt, and cinnamon until mixture seems light in weight. 3. In small bowl, mix together plain yogurt and lemon juice. Let sit 5 minutes to sour. Then, in a medium bowl, whisk eggs by hand until gently beaten and foamy, then add yogurt/lemon juice mixture, molasses, vanilla, and oil. Whisk until well blended. 4. Slowly add wet ingredients into dry and then fold in until well-blended and incorporated. Carefully pour batter into cake pan, trying to not disrupt the pear design. Gently spread with back of spoon. 5. Bake in preheated oven for 25 minutes, or until cake springs back when lightly touched in center and tooth pick comes out clean. After 5 minutes, run a sharp knife around the edge of the pan. Invert onto serving plate. Hint: if you are not Dairy Sensitive, this is absolutely amazing served with a drizzle of Fleur de Sel Caramel Sauce. This is also wonderful served with your favorite Dairy or Dairy-Free Vanilla or Cinnamon ice cream. The other bloggers that are participating in today’s Dessert Course are below. 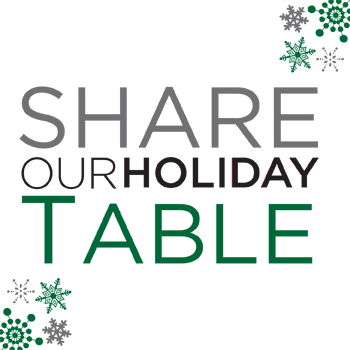 And for the entire menu and all the participating bloggers, go to the Share Our Holiday Table main page. Thank you for what you shared. My thoughts exactly. Speaking of “thoughts” … how is it that we are so often on the same wave-length. Kind of scary! I did an upside down pear cake thingy last week. We must have similar cravings 🙂 Has all settled down? Lexie, I have thought many times that is so funny how often we are on the same wavelength. I hope you will be posting your “upside down pear cake thingy” recipe soon. 😉 And yes, all has settled down now. Waw, my friend! 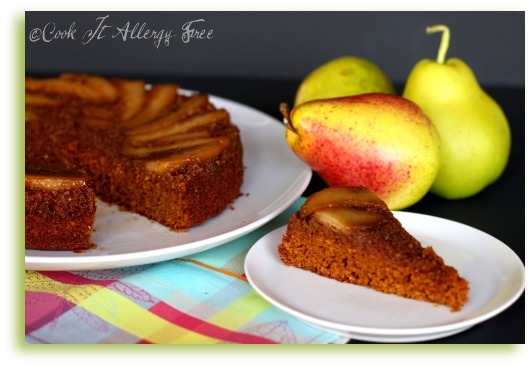 This upside down pear gf cake surely rocks!! Looks truly appetizing & lovely at the same time! Your recipes never fail me & are always apart & tasty! Wonderful post and beautiful upside down cake – I love that this is such an easy combination of ingredients, and it sounds perfect for the holidays. Thanks so much for sharing, I’m so happy to be able to participate in this event with you. Hi Jenn. Thanks so much. This cake is so simple to put together-takes no time at all. I am honored to participate in this event with you!! Kim – so true. We have much to be thankful for and the ability to share some of it with those less fortunate. Particularly less fortunate children…who do not have the ability to change it for themselves. I loved your sentiment. And, the cake. It looks simply yummy! Holy toledo, that is BEAUTIFUL! wow! what a fantastic recipe, Kim. I look forward to testing it out in my own kitchen. Oh yum! I don’t care for pears but I bet apple or persimmon would sub well. Love the base cake recipe. Great post! You’re so right Kim. I can’t even imagine what it must be like for some Moms. It breaks my heart when I stop to think about it. 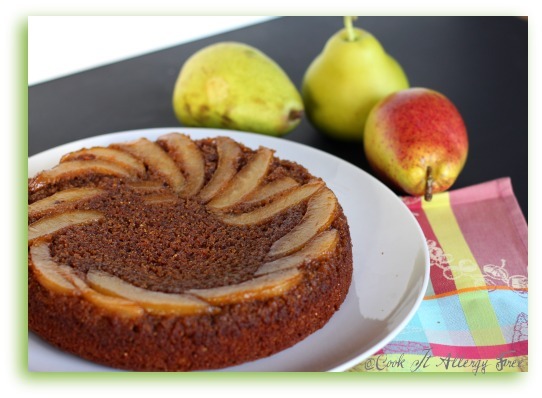 Your pear cake sounds and looks delish! Maggie, when I think about what it must be like for a parent that is unable to feed their child, it literally makes me want to cry. Nothing makes me happier than to watch my children enjoy their nutritious meals. I cannot imagine the feeling of not being able to provide that for them. This recipe sounds great! I’m allergic to corn. Would almond meal be an acceptable substitute? Hi Jillian. 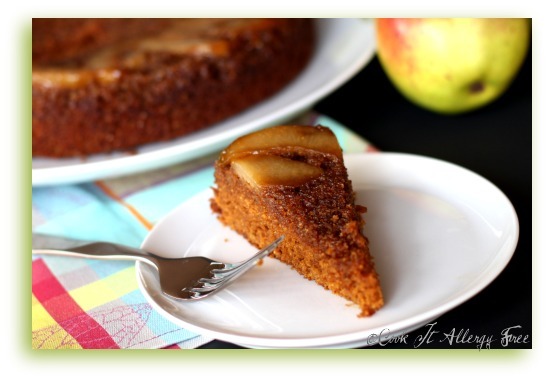 This upside down cake is actually delicious with all almond meal and no cornmeal. I have made it that way quite a few times but when I do, I also add an extra egg since almond meal is a little heavier and seems to do better with the extra egg. This cake looks delicious, love the pears on top, and the deep rich color. Thank you for sharing this recipe in support of such a wonderful cause. In the busy of life is easy to just focus on getting things done and trying to stay on schedule without remembering how others live. Hopefully the No Kid Hungry campaign will increase awareness to the point where there will no longer be people going without food. Your cake looks so good. I love cornmeal cakes. Hi Carol. It is so very easy to get caught up in our lives and forget how wonderful we may have it. This is a great cause and I hope that it does make us remember just a little bit more about those who are really struggling, especially during this time of year. Lovely job, Kim. With all that’s been going on, you still managed to write beautifully,create a wonderful dessert, and get a great shot(or two). Inspiring. If I hadn’t already donated generously, I would feel moved to do so right now. Zoe, you are so right that we need to remember to give thanks all of the time, not just the holidays! Cardamom would be an awesome addition to this and you can make this with all almond flour instead (I would maybe add an extra egg though-but totally not necessary). A lovely post, Kim. I, too, am amazed at how you do it with all going on, but I guess you just do. So happy to be participating in such a wonderful event with such great people/friends. Oh, and your dessert looks wonderful. I think it is going on my make list. I like desserts made with almond flour and less of the white flours. Love and hugs still flowing. Tia, I just mentioned this to Wendy, but I had this post done the week before it was actually due to go up (yes, for once I did NOT procrastinate). Thank goodness. This cake is super easy to make and it is not overly sweet or too unhealthy! 😉 And thanks for all of those hugs and love. It means so much. Nicola, I so pull that “don’t you know there are starving children who would give anything for this meal” all of the time. And I am always trying to remind them of how blessed they are. But sometimes, it just gets too easy to get caught up in my own life. This is a perfect time to work on rectifying that. I love the molassas, but it’s easier to get treacle here, do you think it would make much difference? Hi Intolerant chef! The molasses does not impart a huge flavor here, so I think the treacle in it’s place would not make a big difference at all. Beautifully written post, Kim–thank you so much for it! We can’t have enough reminders to count our blessings. Sorry I didn’t get here sooner. Having lots of ISP issues at the moment. So happy to be a part of this awesome event with you and so many others. I sure hope we make a huge difference! Shirley, you do not ever have to apologize for not getting here sooner. LOL And I was actually relieved to see that you are a little bit off kilter on your series. It makes me feel less behind on that. I like to stay caught up with you since you always have such fun going on over at GFE! And that cornmeal pound cake of yours sounds amazing!!! This is so important Kim! This post is such a great reminder of what we need to be thankful for! I wish I had known about this event earlier so I could have planned to participate. I think what i will do though, is make an extra stop by the grocery stone this month and donate to our local food pantry. Thank you so much for the inspiration! Carrie, I think that is a wonderful idea to stop by your local grocery store and donate to the food pantry. Glad this post could help inspire you! xoxo Hugs!! What a great cause, and what a fabulous dessert Kim! It is so great to see the way everyone is coming togethr! Hey this looks so freaking good that I might just make it TODAY. Thanks!! Kim – what a lovely dessert, and so easy to make. Your writing is just beautiful. I like the fact that you really paid attention to the thoughts in your head as you started your day. If more of us, myself included, realized the self-talk gyrations we go through, perhaps we might stop and take stock more often, and count our blessings! this looks truly scrumptious! My pear and cinnamon loving son will love this, I have bookmarked this for future eating! Great recipe! looks amazing. i’m making it this weekend. This is so good! I made it tonight! I loved it! And I thought I would let you know what substitutions I made so others could know too. I used a square pan instead a cake pan. I used 1/3 c. coconut sugar and 4 T. (1/4 c). coconut oil that I melted both together in the microwave…careful, it can burn fast. Then I made the rest as it says except I used a mix of ideal brown sugar (which is mostly xylitol) and coconut sugar for the “granulated sugar” and I only used 1/2 c. instead of 3/4. I also used 1/2 c. homemade coconut milk mixed with lemon juice instead of yogurt and omitted the extra oil since it was runnier batter b/c of the milk. It is soooooo good! I had to cook a little longer but it is very very good and I enjoyed by my roomates and friends who are not gluten-free!